Just minutes from the edge of Tucson, you can find campgrounds that are equal or better than the best you’ll find in some states. The desert and nearby mountains provide outstanding scenery, and the birds and other wildlife are surprisingly abundant. The different elevations found around Tucson also create opportunities for a diverse range of camping experiences, from setting up next to a saguaro in the heat of the desert to pitching a tent under a tall ponderosa pine near a lake. Where you choose to camp may depend on the season. Higher regions make great escapes in the summer but are too cold for camping in winter. It’s also worth noting that tents and RVs coexist quite amicably in most of the campgrounds around Tucson. RVers who want to enjoy the natural surroundings don’t need to limit themselves to an urban RV park, and tenters have a full range of options. Here is our list of the top picks for the best campgrounds near Tucson. If you truly want to camp in the desert while still having the convenience of a designated campground, you can’t beat the Gilbert Ray Campground. Campsites are surrounded by saguaro and prickly pear cactus, and the views stretch out to the mountains and distant valley. Only a few sites have shade covers; almost all are in full sun. 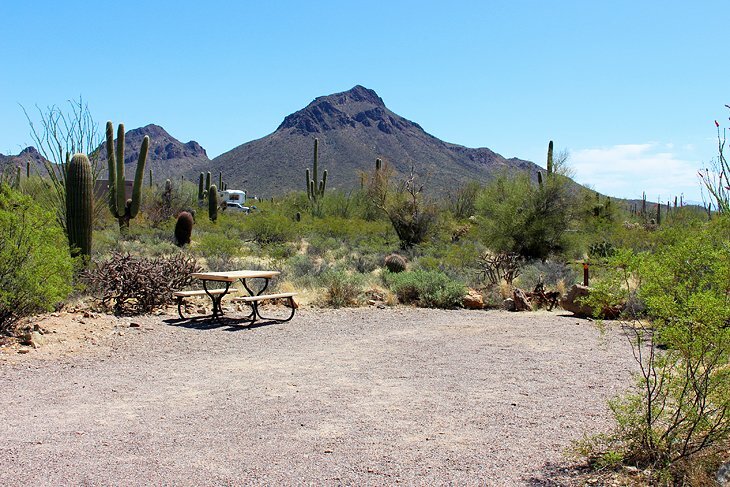 This campground, only 13 miles from Tucson, puts you right on the doorstep of the west section of Saguaro National Park. Just down the road are hiking trails, Old Tucson Studios, and the Arizona-Sonora Desert Museum. This is a Pima County campground with 130 sites, all first-come, first-served. It can accommodate tents and RVs and has 30-amp electrical hookups. You can stay up to seven days and then must vacate for a minimum of seven days. As a result, if you are just arriving without a reservation, you have a relatively good chance of getting in here.